What's worse than having a nasty confrontation with someone first thing in the morning? If you're violent anti-Scientologist Marty Rathbun, how about having another confrontation later in the day - and 2000 miles away from the first one. That's how Rathbun started the month of September - like a crazed maniac. The first target of his wrath was investigative reporter Jim Lynch. As Rathbun arrived at the Phoenix airport for a flight back to Texas early on the morning of Sept. 1, Lynch was there to ask Rathbun a question. Instead of a no-comment, or, just silence (something that Rathbun is incapable of), the burly anti-Scientologist responded by madly swinging a large suitcase square into Lynch, who fell to the sidewalk. As is usual with Rathbun, law enforcement turned up in the shape of TSA agents and officers of the Phoenix police department. Somehow, the hulking Rathbun was allowed to board his flight. And while no one knows what he ingested on the flight to Texas, Rathbun was primed for more violence when he arrived home late that day. Documentary filmmaker Jim Moore bore the brunt of this attack - as Rathbun lunged at him, pulling his glasses off Moore's head - and - in the process gouging two bloody claw marks on Moore's forehead. Moore's offense - going about his business on a public street. Why it drew Rathbun's paranoia and white-hot anger remains a mystery. 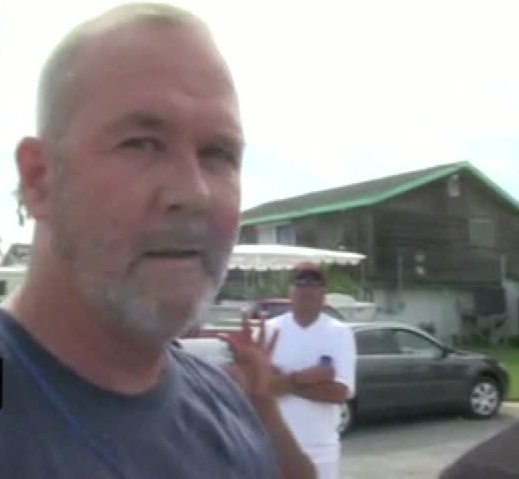 The filmmaker filed a police report, but, it wasn't his first brush with the violent Rathbun. In another earlier incident, Rathbun hosed down Moore's cameraman’s equipment - causing extensive and expensive damage. For Rathbun, it might have been a first - starting and ending his day with out-of-control violence. Later, he reaped the rewards of his physical outburst – a brand new shiny pair of bracelets (handcuffs) – as he was arrested and carted off to jail by a Sheriff’s deputy.